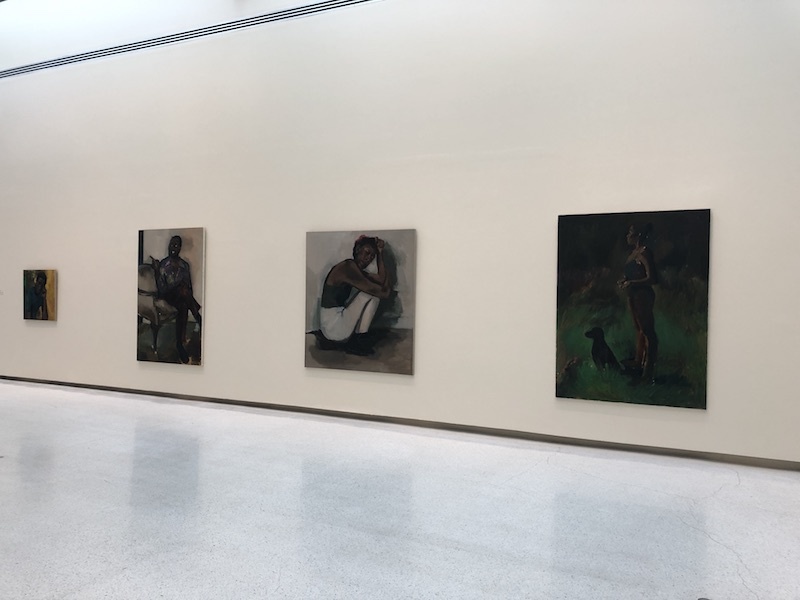 Installation view of Lynette Yiadom-Boakye’s contribution to the 2018 Carnegie International at the Carnegie Museum of Art in Pittsburgh. Tonight at the Carnegie Museum of Art in Pittsburgh, at a gala dinner toasting the opening of the 57th edition of the Carnegie International, the winners of the exhibition’s prizes were announced, with Lynette Yiadom-Boakye taking home the Carnegie Prize and Postcommodity the Fine Prize. Each award comes with $10,000, and the Carnegie Prize also includes a medal, designed by Tiffany & Co., that has been presented to each of its winners since the exhibition was founded in 1896. Yiadom-Boakye’s contribution to the International was looking like a leading contender from the moment the exhibition opened this morning: it’s an airy room of tender, nuanced paintings on linen that show young black men and women—all fictional creations of the mid-career artist, who’s based in London and of Ghanaian heritage—posing against brushy fields of color. In one, a man holds an owl against a field of whites and grays, both of them gazing at the viewer. In another, a woman faces to the left, standing alongside a dog in a verdant patch of brushy strokes, all greens and browns and blacks. Installation view of Postcommodity’s From Smoke and Tangled Waters We Carried Fire Home (2018), on view in the Hall of Sculpture at the Carnegie Museum of Art in Pittsburgh as part of the 2018 Carnegie International. 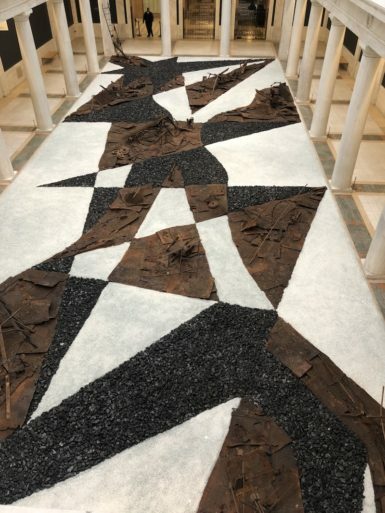 Postcommodity, a collective whose members hail from different indigenous nations, provides another one of the International’s grandest moments, a low-lying installation that covers almost the entire floor of the museum’s Hall of Sculpture with angular patches of crushed glass, coal, and rusted steel sourced from the businesses Dlubak Glass and St. Nicholas Coal Breaker, located respectively in the nearby Pennsylvanian towns of Natrona Heights and Mahanoy City. Titled From Smoke and Tangled Waters We Carried Fire Home and alluding to the practice of Navajo sand painting, it’s been conceived as a kind of graphic score that jazz musicians will be able to interpret from the gallery above throughout the run of the show. The jury was made up of Carin Kuoni, the director of the Vera List Center for Art and Politics at the New School in New York; Ruba Katrib, curator at MoMA PS1 in New York; the independent writer Magalí Arriola, who’s based in Mexico City; Ellen Kessler, who chairs the museum’s board; Douglas “Woody” Ostrow, who’s a board member; Catherine Evans, the museum’s acting co-director; and Eric Crosby, its curator of modern and contemporary art. The International, which was organized by Ingrid Schaffner and includes more than 30 artists, opens to the public on Saturday, and as it happens, Yiadom-Boakye will be leading an hourlong drawing program, open to all, at 3:30 p.m. The exhibition runs through March 25, 2019.